Students learn about life, leadership, themselves, and the world, by spending time serving others. Whether locally or abroad, service opportunities help students honor God as they discover yet another avenue to put action to their faith. 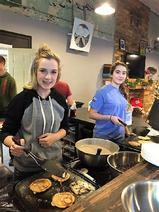 It is one part of GC's experiential learning opportunities. Be My Witness (BMW) is the Eagle Nation community service program. Based on Acts1:8, BMW service projects provide students and staff with opportunities to meet needs in the community through personal, group or organized school service projects. Twice each school year, secondary students leave their classrooms for a day to participate in campus-wide BMW Day with organizations, neighborhoods, and churches. Elementary classes often launch their own projects like creating gift bags for patients undergoing chemo therapy. Secondary students have the opportunity each year to partner with an organization or church in another state and provide in-person assistance on projects and everyday tasks. 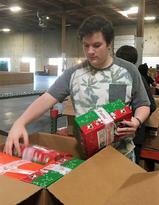 Last year, students partnered with The Hub in Shreveport to work for a week during the holiday season. Students raise money to pay for trip expenses and some of the supplies that will be used in the service projects. Sophomores, Juniors and Seniors can apply to participate in foreign missions. 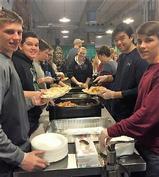 Students raise money to pay for trip expenses and some of the supplies and costs associated with the service projects. International mission trips have included Mexico, Honduras, and The Dominican Republic. This year, students will be traveling to Costa Rica to work with Strong Missions who help children and families gain the necessary resources for a healthy life.